Title: 11/10/1986 - Requirements for target organ effects on labels under the Hazard Communication standard. This is in response to your letter dated August 18 regarding the Occupational Safety and Health Administration's (OSHA) Hazard Communication Standard (HCS), 29 CFR 1910.1200. The labeling requirements addressed in my June 3 memorandum to Regional Administrators has been changed. Target organ effects are no longer required for in-plant containers. Target organ effects, however, are still, and have always been, required for all shipped containers. Therefore, if you sell an aerosol product to manufacturing users, which contains a hazardous ingredient(s), the organs affected must appear on the label. The HCS does not provide specifications for label size. However, the label must contain all of the labeling information required by the standard. If a HMIS label is to be used on a shipped container the target organ effects and the name and address of the chemical manufacturer must be added to the label. If you have any further questions please feel free to contact us again. 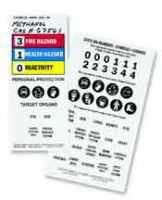 Safety Emporium has target organ labels and more for assisting with your OSHA compliance needs. I just received a copy of your memo dated June 3, 1986, to the Regional Administrators on labeling requirements for the Hazard Communication Standard. In your memo you make reference to labeling for target organ effects in addition to the HMIS identification system. Our company manufactures aerosol products for many marketers who sell these cans to manufacturers. The cans are labeled with many warnings and the 2 1/2 inches by 6 inch panel used for directions, warnings and other label copy is filled now. Please advise if there is a minimum size that requires the complete OSHA labeling. These cans are less than 1/2 pints and contain many materials found in the household like anti-static agents, silicones, oils, glass cleaners etc., but we sold to industry. I also note this change takes effect on August 23, 1986. In some cases over 50,000 to 75,000 cans are out in distribution which may be there for over a year without this new labeling. I would appreciate an early response. Thank you for your help. Store your flammable aerosols in these flammable cabinets from Safety Emporium.